1. Finely slice 100g essential Waitrose radishes and ½ essential Waitrose cucumber, and put in a bowl with 2 essential Waitrose carrots, grated. 2. Whisk together the juice of 1 essential Waitrose orange and 2 tbsp olive oil, season and pour over the salad. 3. Heat 1 tbsp olive oil in a frying pan. 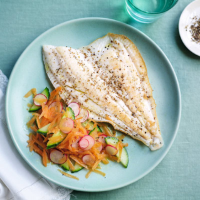 Sprinkle 4 plaice fillets (about 150g–180g each) with 1 tsp ground cumin, season, then pan-fry in batches for 2–3 minutes on each side. Serve with the carrot salad.